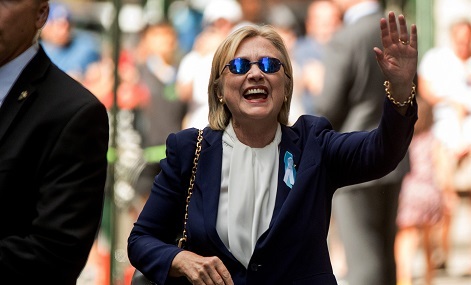 After her collapse following a memorial commemorating the victims of the 9/11 attacks in New York, Democratic presidential nominee Hillary Clinton was forced to cancel a fundraising trip to California in order to rest – as prescribed by her physician- raising concerns about her physical well-being. It has since been revealed that she was diagnosed with pneumonia on Friday, causing nationwide suspicion that her overall health is not what it should be to take public office. If Clinton wins the election, she will be the second-oldest president to take office at 69 years old. Trump would be the oldest at 70, beating out Ronald Reagan for the title. There has only been one time in election history when a nominee had to be placed on the campaign trail and it was a Democratic nominee. Just months before the 1972 presidential election, presidential nominee George McGovern discovered that his vice presidential nominee Thomas Eagleton had had multiple bouts of depression and related hospitalization. Instead of taking chances that his mental health background would hurt the ticket, the Democratic Party replaced him with a former ambassador, Sargent Shriver. Interestingly, the history of the presidency includes a running thread of illness and incapacity that is always shrouded from public knowledge on purpose, dating back to Grover Cleveland who needed surgery in 1893 to remove a cancerous tumor in his mouth, yet did it in secret, on a friend's yacht cruising through Long Island Sound and Woodrow Wilson in 1919 who was incapacitated by a stroke, yet no one knew until many months later. With the advent of broadcast media, though, it became increasingly difficult to hide a public servant’s illness. Although there is video footage of his disability, the public had limited information about Franklin Delano Roosevelt’s condition when he ran for president in 1932. The press corps purposely avoided mentioning that Roosevelt used a wheelchair and by the time he ran for a fourth term in 1944, he had heart disease, was constantly tired and had trouble concentrating. He died just months later, in April 1945, leaving Harry Truman to take his spot, close out World War II and make the difficult decision about dropping atomic bombs on Japan when he wasn’t privy to the Manhattan Project before then. Besides Roosevelt, three other presidents -- William Henry Harrison, Zachary Taylor and Warren G. Harding -- died in office due to illness. Now, due to social media and the press’s more aggressive commitment to anti-censorship, Clinton’s and other public officials’ medical background shall continue to receive an increase in exposure.